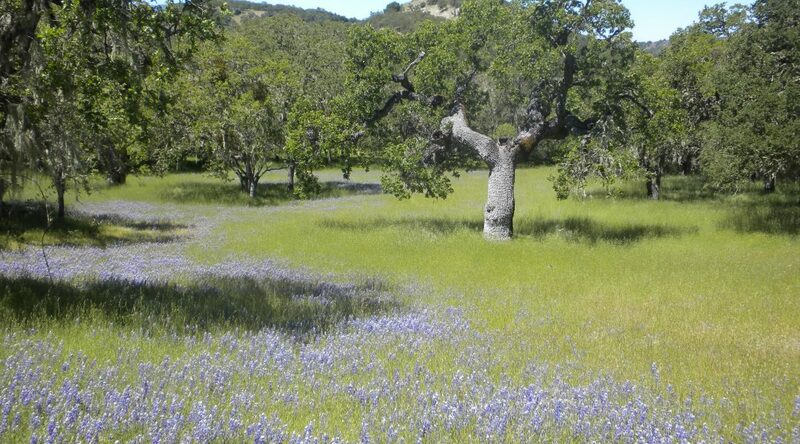 The Hastings Reserve is a low-elevation (~300 m) central coastal California oak woodland. Knops and Koenig (2012) tracked fecundity beneath open-grown individuals of Quercus agrifolia, Q. douglasii, and Q. lobata over six years. The seed crop was quantified from accumulated acorns in seed traps beneath isolated trees. Our treatment of the data allowed for variability in seeds arriving within traps and uncertainty in the fraction of the crop that was counted, based on measurements of crown area, as discussed here. In this study seeds in traps were weighed, not counted. The estimated seeds per trap is obtained from seed mass of each species. The crop count for an individual tree y is the number of seeds accumulating within three traps each with a collecting area of A_s = 0.196 m^2. 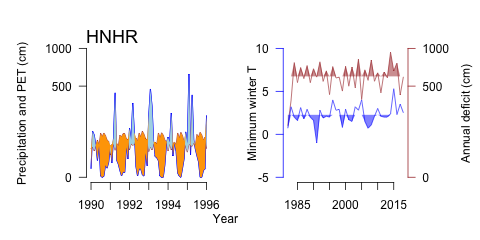 Water balance during study years, showing large summer deficits (left), and longer-term anomalies in deficit and minimum winter temperatures (right).